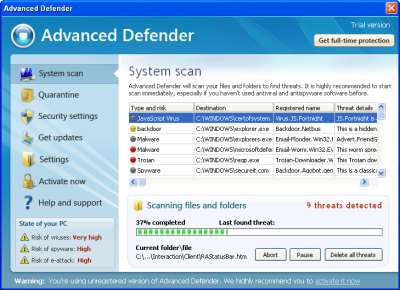 Advanced Defender is a fake security application. It drops files in the system (non PE files) and detects them as fake infections to scare users. It also prevent legit softwares execution, displaying an alert/infected message. If your PC is infected with Advanced Defender use MBAM to remove the infection.